Directed by the maker of The Bourne Series, Doug Liman this movie maintains the same pace and feeling of an action thriller. Based on the true life story of Valerie Plame and Joe Wilson, the movie is one more that looks at the truth and lies behind the search for weapons of mass destruction in Iraq. The Green Zone is one other movie that comes to recent memory but of course I am not comparing the two. This one is a political-spy thriller and really keeps you involved. The movie is based on the story that officials in Washington leaked to the press that Valerie Plame is a CIA Covert operations officer after her husband Joe Wilson, a former ambassador did an op-ed piece in the New York Times titled 'What I didn't find in Africa'. The op-ed essentially disputed the government's claim that raw material to Saddam's regime was purchased from Africa. This sets of a chain of events that lead to Valerie being left out in the cold and the many depending on her for safety and escape losing out. The movie captures the journey of Valerie before and after the 'Plamegate' incident. 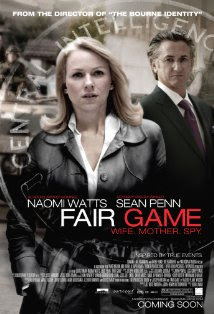 The actors Naomi Watts (as Valerie) and Sean penn (as Joseph Wilson) remarkably resemble the real life characters to a large extent and put in easy performances. The story and the performances along with all the other material on this subject only make you ask yourselves- 'Was the Iraq war the biggest con job in history by the US Government ?' . What this movie does is make you ask this question. The answer is left to your own belief, political or otherwise. The movie is well directed. It does not lose track or tempo and is intelligent enough to involve you without sensationalizing anything. Naomi Watts notably does a good job as valerie. Do not miss the real-life footage of the actual Valerie at a senate hearing, which appears when the credits roll. "The story and the performances along with all the other material on this subject only make you ask yourselves- 'Was the Iraq war the biggest con job in history by the US Government ?'" ... Elementary, my dear Watson!